GRAHAM is ready to start the 2012 RBS 6 Nations Championship for the fourth consecutive year. As Official Timekeeper of the Championship, GRAHAM provides all RBS 6 Nations referees with dedicated GRAHAM chronographs. The Chronofighter Oversize Referee is the ultimate chronograph available on the market which perfectly fits the tough and intense atmosphere of this legendary tournament. For the fourth consecutive year, GRAHAM is the Official Timekeeper of the 2012 RBS 6 Nations Championship. A long term partnership with this prestigious rugby Championship involving 6 of the best northern hemisphere rugby nations. Highly sophisticated and old school the RBS 6 Nations’ Championship is a noble competition which has survived to modern times. 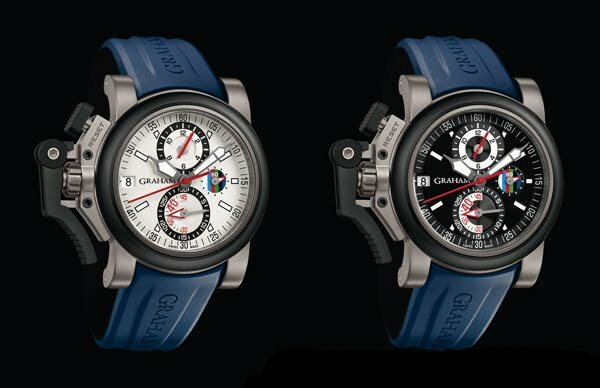 It meets GRAHAM values of valiance and passion which give life to our timepieces. As Official Timekeeper of the Championship, GRAHAM provides all RBS 6 Nations match referees with dedicated GRAHAM chronographs to assist them in performing their match duties in the most accurate manner possible. The Chronofighter Oversize Referee is all about RBS 6 Nations. Indeed it was developed to reflect the RBS 6 Nations Championship. The 6 squads’ colours are featured in the second counter at 3 o’clock. The official logo is also on the case back. The Chronofighter Oversize Referee was conceived based on the needs of the referees. As the watch is worn by referees in all the matches, GRAHAM developed a specific titanium light-weight case with rubber coated parts. The watch is light to wear and safe. They asked for readability. GRAHAM opted for a white dial to emphasise the 30 double-graduated minutes counter at 6 o’clock. The watch is powered by a modified Valgrange movement that displays 3 counters. The minute counter shows an internal 40 minutes graduation which accurately times the halves of each match. The referees can control the match time and let all the actions take place. To operate the watch smoothly, GRAHAM used the left drive lever mechanism, which is unique to the brand. It is so intuitive to use that you don’t even need to look at it. Start. Stop. The chronograph is right there under the full control of your thumb. This year the watch comes with a blue hypoallergenic strap. That’s British elegance, even on the field. In the end, the model combines precision, readability and advanced material to be up to its Championship reputation. We are now looking forward to seeing the first seconds of the game run on the dial of the specially designed Chronofighter Oversize Referee. Let’s kick off the 2012 RBS 6 Nations Championship! 47 mm titanium case, calibre G1735, automatic tri-compax chronograph, 25 jewels, 28’800 A/h (4Hz), Incabloc shock absorber, 48 hours power reserve, domed sapphire crystal with antireflective coating on both faces, see-through sapphire case back with RBS 6 Nations’ logo, integrated blue rubber strap.